Ofer Zivony 3d of Israel taught himself to play go when he was 19 years old using a 9×9 board. 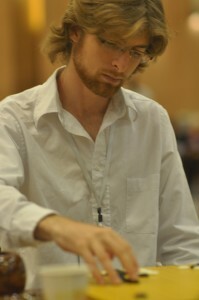 His mother is an architect and his father, now retired, is a very powerful bridge player. Ofer tries to balance his time between studying go and seeing his girlfriend, who does not play, he says, smiling ruefully. Now 26 years old, he is attending the university in Jerusalem as a student in visual arts. Last year he won a scholarship to study go in South Korea. This improved his game and he came to China with a team to compete in a China-Korean tournament.